MASS CONSTRUCTION. 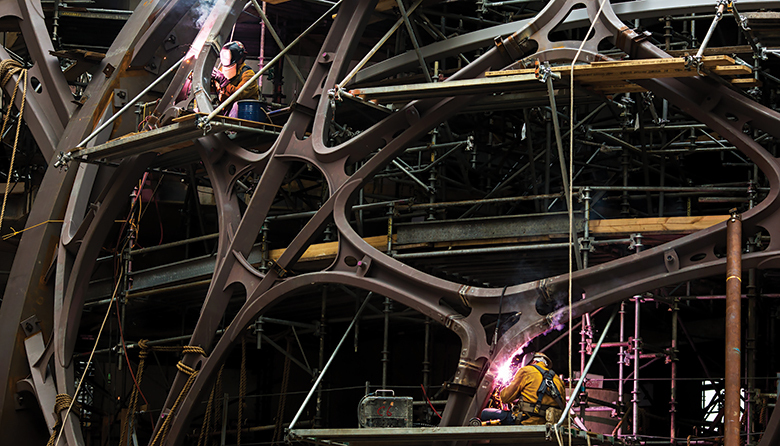 Amazon’s iconic Spheres building on Seventh Avenue in downtown Seattle opened in 2018. By any measure, downtown Seattle is thriving. Developers completed 28 projects in 2018 and launched 40 more. Another 161 projects are either awaiting permits or are in the planning stages. But Downtown Seattle Association President and CEO Jon Scholes, while touting unprecedented growth, has some words of warning: Two decades of steady progress could quickly unravel unless the region successfully tackles some persistent issues, notably the lack of inner-city affordable housing and mounting homelessness. “We have got our own imbalance here,” says Scholes, noting that downtown businesses have created 85,000 jobs the past eight years but only 38,000 new housing units have opened. While downtown Seattle businesses have added jobs — an average of about 30 per day — consulting firm McKinsey & Co. identified a vicious cycle: Homelessness has risen along with rent, which in turn increased because of King County’s rapid economic growth. Average rent in Seattle in January was $2,125 per month, according to Rent Jungle, a 2 percent increase from last year and almost twice as much as it was in 2011. Another recent study by think tank Brookings Institution found that the Seattle area ranked a lowly No. 86 out of 100 cities across the country for economic inclusion, or opportunity for all citizens to participate in economic prosperity. It’s one reason why, at press time, the Seattle City Council was discussing mandatory affordable housing legislation in the city’s urban villages, and why the state Legislature was considering extending eviction notifications from three days to up to three weeks. If the region fails to tackle those and other issues, recent positive activity — including the opening of the new SR 99 Tunnel, the potential for waterfront redevelopment and the razing of the Alaskan Way Viaduct — could all be for naught.